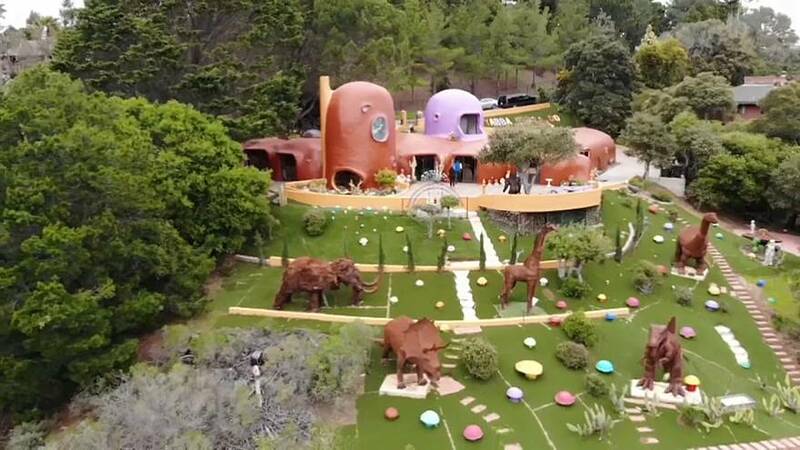 An upscale California suburb is filing a lawsuit against a homeowner who created an elaborate homage to the 1960s cartoon family, the Flintstones. Dinosaur statues, painted mushrooms and a giant Yabba Dabba Do sign are among some of the attractions residents of Hillsborough want retired publishing mogul Florence Fang to remove from her property. But thousands have signed an online petition to save the property, which has become a local visitors' attraction. The 832 square-metre house itself is not at stake, but the town says the multimillion-dollar property is a public nuisance and an eyesore. Officials filed a lawsuit in state court last month to force Fang – who does not live in the house but uses it to entertain – to remove the garden installations. Angela Alioto, the 84-year-old's attorney, says officials want to squelch Fang's constitutional right to enjoy her yard, and promises a vigorous fight. "It's always been a very popular home in Northern California. People love going by it on (highway) 280. They look forward to it" she says. The oddly shaped house, currently painted red and purple, was designed by architect William Nicholson and built in 1976. Fang, a prominent philanthropist who once published the San Francisco Examiner, bought the property in June 2017 for €2.5 million ($2.8m). Mark Hudak, an attorney for Hillsborough, says the town prides itself on its "rural, woodsy feel", and that Fang has to go through the planning process like everyone else. "What is at issue is the installation of dinosaur and animal statues, Yabba Dabba Do signs, lots of other decorations – all of which need a design review and building permits, which she didn't have," he explains. "Most town residents that I've talked to feel like this entire installation is far out of character for the town of Hillsborough. And they worry that if it's allowed to go on here, maybe somebody else will want to put up a Jetsons or Star Wars installation elsewhere in the town that everybody's going to have to look at all the time." Alioto's response is that Fang's constitutional rights to free speech are being violated. She said: "Nobody thinks it's a nuisance except for the town of Hillsborough. And she has a First Amendment right to do what she wants to do in her own backyard."